I’m a programmer and a gamer, so I spend most of my day using a keyboard and mouse. I haven’t had serious issues with repetitive strain injury, but my hands and forearms do get tired and uncomfortable after a long day on the computer or a number of days without a break. I’ve tried a lot of things to head off the risk. First and easiest was switching to an ergonomic keyboard. Some people are afraid of split keyboard layouts, but you get used to it very quickly and it allows your arms to remain at your sides where they belong. You could start out with a cheap Microsoft Natural 4000, which also allows for negative tilt – you don’t want your wrists bent upward. The next step to keyboard bliss is ditching the staggered layout, which requires you to twist your wrists at unnatural and asymmetric angles. Good options here include the Truly Ergonomic Keyboard or an ErgoDox, either in kit form or prebuilt. (Try the kit – I had a blast soldering it together.) One great benefit of the ErgoDox over the TEK is that you can “tent” the keyboard, meaning to raise the center so that your wrists don’t have to twist to lie unnaturally flat. If you use a laptop keyboard consistently, you’re at greater risk of RSI because you’re contorting your wrist in multiple dimensions whenever you type. I recommend hooking up a keyboard, even for travel – you can get 40% or 60% keyboards or a compact split keyboard to take with you. And, if possible, don’t actually use your laptop on your lap where you’ll have to look down at a sharp angle for long periods. Mice have a lot of problems. One is that you generally either have to squeeze the mouse or move your whole arm to move the pointer, depending on your grip. Another is that you have to torque your wrist over to lay your hand flat on top of the mouse. Ergonomic mice tend to be right-handed only, and “solve” the problem by having the left side of the mouse be taller so that your hand can lie on it at a bit of an angle. Evoluent VerticalMouse 4, also available for lefties! The logical extension to this is the vertical mouse – a type of mouse that lets your hand sit perpendicular to the desk. One good example of this is the Evoluent VerticalMouse 4, which I used for almost two years. It’s much more comfortable (at first) and doesn’t take much adjustment. The biggest adjustment for me was due to the fact that it’s taller than a regular mouse, so you have to lift your hand a bit more when switching between keyboard and mouse. I got over that and thought I had found mousing nirvana. I’m still typing, so obviously it wasn’t nirvana. The problem, which I only found after repetitive strain over the course of a year or so – you no longer have the benefit of the desk pushing up against your finger when you click. You have to squeeze your thumb against the mouse to keep it still when clicking. Essentially, you’re squeezing your whole hand to click, every time. I click a lot. My thumb is sore. I wasn’t expecting that. The VerticalMouse also started missing a significant portion of my clicks after a year or so, and this happened with two of them, so there may be quality issues in the switch. I decided it was time to try something different. An underappreciated classic. The trackball. 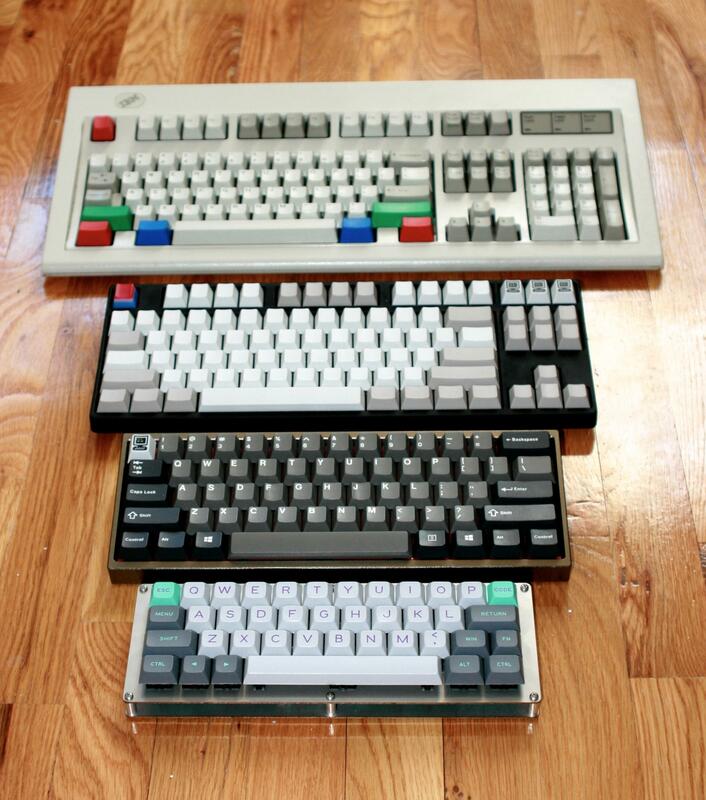 Sadly, there aren’t a lot of trackballs being made these days. I assume that’s because “gaming mice” have taken over the market and people don’t think trackballs can be used for gaming. (Not true!) In any case, I did a lot of research on what’s available. My first stop was the cheap, well-reviewed Logitech M570. It’s got four buttons and a clickable wheel to go along with its thumb-controlled trackball. (Many trackballs lack extra buttons or a wheel, features I don’t think I could go without.) It’s wireless; I prefer wired, but Logitech’s solution works well and didn’t have any noticeable lag. I used the M570 for about a week. It’s well made and comfortable to hold, being sculpted to fit a (small) hand. What a bargain, too! The trouble for me is that the thumb-controlled trackball doesn’t solve my problem from the vertical mouse – my thumb is overworked. I found my thumb getting rather tired after a day with the M570. Plus, thumbs aren’t as nimble as fingers, so you’re necessarily limited in how precise you can be with this style of trackball. The Kensington Slimblade is similar to the Expert, but looks a bit classier, and trades the scroll ring for the ability to twist the ball to scroll. It’s also got a level base, which I consider a nice plus – you can choose a wrist rest if you want one, but it’s less likely to be required. I bought the Slimblade and used it for a couple days. The construction is pretty good, and it’s comfortable to hold. It’s got the same basic button layout as the Expert, but the buttons are part of the single piece of plastic that makes up the body; the practical effect is that it takes very little effort to push the buttons near the ball and progressively more effort to push them away from the ball. I don’t like this, because it means you either need to use your pointer finger to push the primary button on the left, near the ball, or you use your thumb to press further away from the ball and have to push pretty hard. This gets tiring quickly. I had a couple mechanical issues with the Slimblade. One is that twisting the ball made an annoying grating sound, plus a generated clicking sound. Another is that the top right button felt different than the others; you could feel two clicks before it activated. These are common complaints for the product. The Elecom M-DT2URBK looks a lot more like a standard mouse, but has a finger trackball where the primary buttons would be. The primary button and wheel are moved to the thumb, off on the left, along with back/forward buttons. There’s a slim button to the right of the ball for right clicking, and a few programmable buttons on the left. I haven’t tried the Elecom in person, but I really like the design, and it’s unique in the field today. You’re not giving up any useful controls. (It’s reminiscent of the beloved, discontinued Microsoft Trackball Explorer, which can now sell for over $600.) Even though the primary button is under your thumb, and I’m wary of tiring out my thumb, it’s activated by a squeeze rather than a lateral downward push. If I had to pick one, I’d pick the squeeze, since that’s a more natural movement. Still, in the end, I was turned off by all the controls on the thumb. Worse, though, is the size of the trackball – it’s the same as the M570, a smaller ball meant for the thumb. You’re intended to use it with just your index finger, with your middle finger on the right button and your ring and pinky fingers in the grooves on the side. I wasn’t willing to trade a tired thumb for a tired index finger, while getting less precision than a typical finger trackball. Ok, the grand reveal… my new trackball! The Clearly Superior Technologies CST2545-5W. It’s a beast, made to last, with replaceable parts. It feels solid on the desk. It uses steel rollers, rather than the tiny jewels in the Kensington trackballs, and rolling the trackball around feels smoother to me. I love the precision of rolling around the large, smooth trackball. It’s just fun, and I was quickly able to tell it was more comfortable. In terms of configuration, it’s trivial – no drivers needed. I set the DPI to medium (just hold the right mouse button and press the left to switch) and added some acceleration on the cursor, and I can hit a single pixel or glide across the screen, all without lifting my hand. I like the button layout. The left and right buttons are long – they span the full height of the trackball and then some. This means you can press them with your index finger at the top, or your thumb at the bottom, and they’re pretty easy to push in either spot. Having that flexibility reduces the chance of stressing out any one muscle. The middle button is above the wheel, easy to find with a little bump. The scroll wheel sits above the middle button. It’s very smooth and feels nice to operate. It doesn’t spin freely, but doesn’t resist either. It may be a little hard to reach if you have small hands, but mine are average and I’ve found a comfortable spot where I can move the trackball or operate the wheel without moving my hand. The “5W” in “CST2545-5W” indicates that this model supports 5 buttons. See those two jacks on the back? You can plug in extra buttons and place them wherever you like. You can buy them if you want, but they’re also trivial to make; I’m building my own out of Lego and keyboard switches with inspiration from this guide by ripster. One downside to the CST, similar to the Kensington Expert, is the angle of the base. It encourages upward tilt of the wrists. I’d prefer the whole body be shorter, but I use a wrist rest for comfort anyway and it raises up my hand enough to avoid the issue. There are a number of available models; one without a wheel, one with switch jacks that replace the primary buttons instead of complementing them (the SAW model), one without switch jacks, and a couple with glowing trackballs. I hope this helps. Even if you’re not interested in a trackball, please consider the strain you’re putting on your hands if you use a computer all day. Make sure to take breaks, and stretch regularly. One easy stretch you can do is to spread all of your fingers apart, like you were showing someone the number 5. Hold them there for a few seconds, and gradually use your hand muscles to spread your fingers further so you feel a slight tension. I feel my skin stretch a bit when I do this. Afterward, I can feel the tendons relax a bit. I think it counteracts my tendency to curl my fingers onto the keyboard all day long. Don’t use your other hand or anything else to force your fingers to stretch, or you could hurt yourself. It should feel natural. If anything hurts even remotely, stop. I’m not a doctor, I’m just saying what helps me. Take care of yourself. WakeMate – $50 and you might sleep better. It tracks your sleep patterns and wakes you between REM periods. It seems most useful for heavy sleepers, like me. My wife sleeps very lightly and wakes up often. I don’t think she’d need additional jarring. Samsung’s Galaxy S phones – good Android phones on every carrier… including AT&T. This may be the first real competitor to the iPhone for those locked into AT&T. The only downside is that AT&T doesn’t let you sideload applications, i.e. install them manually. eBook readers – they’re just not there yet. The Kindle (or DX) and Nook are getting there, but they’re just not what I want. I read technical books, so I need a large screen. I don’t care about color, and I don’t want a touchscreen because it lowers the clarity of the screen. I don’t particularly care about the 3G access – I can download books at home, and I’d rather use my phone for mobile internet access. I want simple, cheap, clear, and free. Loss of freedom – particularly with regard to the internet. AT&T has already switched to limited data plans, Verizon probably will soon, and broadband providers have been considering the switch for a while. It makes me sick that this is possible when internet access should be a human right. I know for a fact that capacity far exceeds demand at some of these companies, so it’s dishonest. 3D – ugh. Movies and TV are equally bad ideas. Give me back my Virtual Boy. You can add that line to /etc/rc.d/rc.local (on Fedora, similar elsewhere) to make sure the setting is enabled on startup. Important note if you have Intel 4965 wireless (the card used in the Dell XPS m1330, for example) – the Linux drivers for this card do not work well with “Afterburner” mode in Linksys routers. I assume it’s the same for “Super-G” and modes from other brands. Turn off that feature and you may save yourself hours of trouble. In the spirit of my previous Exherbo review and guide to fixing an Ubuntu crash, let’s do the same for Fedora! Fedora sounded good. All free software with fairly frequent updates. RPM hell is avoided with Yum. I particularly appreciate the use of the free Nouveau driver for my Nvidia card, and Kernel Mode Setting for a smoother start and fewer hassles. When it works, Fedora is slick. They’re a bit ahead of Ubuntu in terms of features, with default SELinux, KMS, and better video drivers. Another thing I appreciate is that one of Fedora’s goals is to stay close to upstream. They don’t want to apply 10 patches to every package, preferring to send patches upstream and get down to zero distribution-specific patches if possible. It’s quick to boot, particularly with KMS. The battery life is about 10-15% longer than with Crunchbang, even with more daemons running. Tim Pope is generously matching donations between now and Christmas on any of his Github projects. All money goes to Vim’s charity, ICCF Holland, that helps children in Uganda. Thanks Tim! This is a continuation of part 4 of my energy drink reviews, a special on ABB. First you get a strong blast of berry flavor, but unfortunately it doesn’t last very long. It fades to a general fruity flavor, similar to the Subzero Red, but has a slightly chalkier texture. I didn’t get an aftertaste, though, so it’s not bad overall. This is a good option if you want a strong energy boost. The Ripped Force drinks have 200mg of caffeine along with some blend called Adrenergic Catalyst Technology. I have no idea what that means, but it gives me a bit of the jitters. The Fruit Punch variety is an interesting beast – it has a nice (though very sweet) fruity flavor at first, and then completely disappears, as if you didn’t have a drink at all. Then, there’s a bit of chalky texture, but no real aftertaste. I haven’t had that experience before, but it’s not too bad – a little better than the Berry Energizing flavor. I love the flavor on this one. That means something because I normally hate lemon-lime flavors. In this one, the citrus is toned down and it’s fairly sweet – not overly bright. The energy level is fairly strong, as in other Speed Stacks, but not as strong as a Ripped Force. There’s a bit of aftertaste, but not of chemicals, just a slightly sweet flavor.